Thanks for the support for my recent listening tour! Thank you to everyone who helped make my recent second annual 12th District listening tour a success. My goal was to visit communities in all four counties again this year and to hear directly from you. 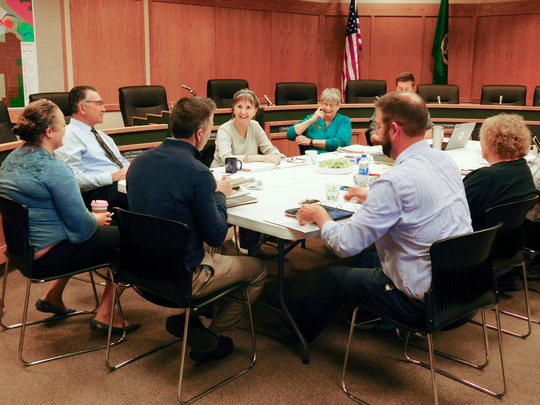 I know what a challenge it can be for many of you to travel all the way to Olympia, and connecting in the fall before the holiday season helps my staff and me prepare for the upcoming session. I really appreciated the time and effort people made to meet with me and share their thoughts. I enjoyed my discussion with the Leavenworth City Council, which was my first stop on the listening tour again this year. Joined by some of my staff and issue specialists, we began day one of the listening tour in Leavenworth and then visited Cashmere where I spoke at the 9/11 Memorial ceremony. Our group then met with several constituents in Wenatchee. The second day started in Chelan, followed by stops in Coulee City and Soap Lake. The tour’s third day began in Waterville before heading north to Bridgeport and Twisp. On September 14, to conclude my visits throughout our district, I led a small group on a community hike on the Patterson Mountain trail near Winthrop. It’s a continued tradition, as last year’s listening tour finished with a community hike up Saddle Rock outside Wenatchee. A hike provides people a chance to enjoy our outdoors and chat with me more informally about issues. Patterson Mountain offers 360-degree views of the Methow Valley, so it’s one of my favorite hikes in the area. I’m very grateful to all of the individuals and groups who participated in this year’s listening tour. I heard a wide range of topics, including transportation, forest health, rural economic development, health care, mental health, rural broadband communication, and more. I learn a lot by listening. On the listening tour, I had a good discussion about rural economic development issues with Mayor ShirleyRae Maes of Coulee City. Click here to listen to my KOHO radio interview with news anchor Dan Langager on the tour’s first day. Click here to read my Wenatchee World guest editorial about the 2018 listening tour. Click here for part of the NCWLife Channel interview before the tour began. Click here for the Methow Valley News story about my stop in Twisp on the tour’s last day. It has only been a few weeks since this year’s listening tour ended, but I’m already thinking about next year’s tour. My staff and I look forward to coordinating another tour throughout our area next fall. Learning more about issues important to you helps me represent our district and serve you better. If you were not able to meet with me during the listening tour but have an idea you wish to share, please do so anytime. You can e-mail me at brad.hawkins@leg.wa.gov or call my legislative office at 360-786-7622.